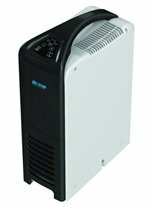 The Eco Air ECO8LDN Dehumidifier has a water extraction capacity of up to eight litres per day. This dehumidifier is compact, to fit more easily into areas where space is tight, and light for easy movement from room to room. Fitted with electronic controls for ease of use this unit is perfect for small homes or to solve a moisture problem in a particular room within a larger home. One of the outstanding features of the Eco Air ECO8LDN is its remarkably compact design. Only 324mm (12.75") wide by 150mm (5.9") it has one of the smallest "foot-prints" of any dehumidifier and yet has the capacity to dehumidify an area of up to 14m2, or 150 sq ft. For a small flat/apartment or a room in a larger house this dehumidifier makes a lot of sense. Where space is a little restricted it will take up the minimum of floor space. The Eco Air ECO8LDN is also a genuinely portable dehumidifier. Weighing only 9kg (just under 20lb) and with a top-mounted carrying handle this unit is no more difficult to move than a loaded shopping bag and can be relocated as and when the need arises. Many people dislike the noise made by a dehumidifier and it is sadly true that all dehumidifiers will make a noise if they have moving parts. The dehumidifiers that do not have moving parts are extremely low capacity devices suitable for closets and wardrobes not rooms. The main source of noise is the fan which draws in air and expels it when it has been dried. Dehumidifiers which use a desiccant rotor to extract water have a fan and typically have a noise output of around 34 to 40dB. Their main disadvantage is that they use more energy to run than the refrigerative type, of which the Eco Air ECO8LDN is an example. This type of dehumidifier has a compressor in addition to a fan and will make rather more noise. Refrigerative dehumidifiers can have a noise level of over 60dB in the case of the most powerful models. The good news is that the ECO8LDN has a noise level of only 43dB. This is quiet by dehumidifier standards but you will be aware of it and if you are a light sleeper it may disturb you at night if the unit is in your bedroom. Any reference to a "whisper quiet" refrigerative dehumidifier is merely "sales talk" and, to be fair, we have not seen Eco Air or their distributors use this term in relation to this unit. The Eco Air ECO8LDN is a low energy consumer drawing 230 watts of power to operate. If the area you wish to use it in is within its capabilities it will be a sound economic proposition. If it is too small for the job it will run continuously and will be more expensive to operate than a properly sized unit. The larger the capacity of a dehumidifier the more water it extracts for each unit of electricity it consumes. A larger dehumidifier operating for fewer hours per day can be cheaper to run than a smaller capacity model operating all or most of the time. Despite being designed for use in smaller areas the Eco Air ECO8LDN incorporates all of the refinements you might expect to find in a good quality dehumidifier. If emptying the water collection container is inconvenient, or simply irritating, it can be set up for continuous drainage to a nearby drain of other outlet. It includes an adjustable humidistat with which the level of relative humidity required may be set and will only operate to maintain that pre-set level, saving energy. The unit is also equipped with a defrost function to counter the formation of ice on the refrigeration coils. This allows the dehumidifier to function at temperatures as low as 5°C and should ensure effective operation when the home is unheated in cooler weather. It also comes with electronic controls. an LED display and a Hepa air filter to remove small particles from the air and improve air quality.